A lot of people have been asking us, when will there be more levels? Well, instead of just saying, how about we show you what went into the next three levels, the design process behind them and show a bit of the gameplay from the new mechanics introduced in them?! Remember though, these levels are still subject to big changes in terms of the visuals (and perhaps minor in terms of gameplay), which is why they aren't released yet. So dont look too closely at the art, and more at the gameplay part of it. Level 8 was a tricky one to design. We wanted a level that really hammered home the robot invasion part of the story. And we went back and forth a lot in terms of how to best display that. We settled on a level which focused heavily on moving robots as obstacles while trying to tie in the mechanics of the previous levels in a new way. Our approach to level design in most cases, is to display a new mechanic or type of obstacle at the start of most levels, then take that and build on it throughout the level and hopefully by the end, the player will master the mechanic. In level 8, you will experience the way the simple and slow basic robots, really change up the way you have to play and make you think more before you click. The robots react through physics and if they are pushed by a platform or go down an edge, they will behave in the same way Ralph does. Because they robots can only go back and forth or fall down, we introduced elevators to pull them back up again and complete their movement cycles. The elevator system fit perfectly as the player had just learned the same mechanic in level 7, but with horizontal moving platforms instead. 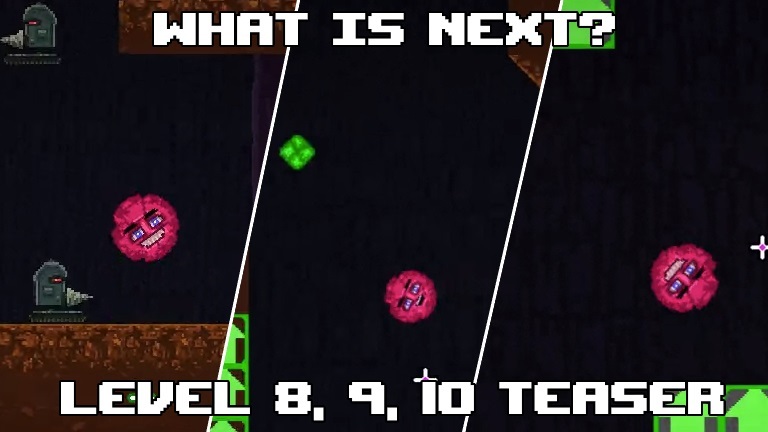 Level 8 is also a level that builds on the speed aspect of the game (as you saw in level 4), a level with a lot of horizontal movement which puts emphasis on reaction time and building up momentum! The previous level slowly introduced vertical movement, and level 9 completely embraces it. Level 9 introduces two new mechanics which switch up ways you think about momentum and allows Ralph to move upwards unlike before. At first glance, they may seem easy to grasp and understand - and they are to an extent, but once you dive down into them, they give you a lot of movement control. This level has emphasis on understanding those mechanics individually, though very simple challenges. Then at the end, you are tasked with combining them and climbing a steep vertical tower. It is a very technical level in many aspects, but also a level which introduces a lot of skips, some which are obvious with a bit of practice, and some with seem impossible at first, but become quite accessible once you are an expert at abusing the new mechanics introduced. We always try to design our levels, so that both your first experience and your expert speed-running experience will feel satisfying and different. Level 10 is the last level before the first boss encounter. This level introduces no completely new mechanics, but rather tests you on the skills sets the player have acquired up till now. This level is also the first level, where the entirety of the level is built inside "1 room" and climbing to the top of that room is the goal. When we first built this level, it was supposed to be really punishing and create a lot of backtracking. However with iterations, we found that creating "safe areas" to fall down, improved the experience greatly. When you fail, you do not want to backtrack minutes of work, you want to get the feeling of failure quickly then get back on track ready to beat that obsticle. The result, is a level which is punishing, but whenever you reach a checkpoint, it feels like you have defeated a part of the mountain, slowly getting you to the top. It is also a level which is supposed to showcase the huge amount of control and skill you can have after 9 grueling levels before it. The level has tons of skips (more than any other level by far) and by nature of it being in 1 room it is possible to build up some jumps and reach much higher. This is one of the levels we are most excited to see how people will solve, as it has many different paths for many different play styles. In the video below, you see some of the dangers you face in that level, and are introduced to a mechanic from level 9 in a new way, which challenges your timing and air control. So there you have it, a small teaser of what is to come. Hopefully this developer log gave some insights into our thought process when designing levels and made you hungry for more frustratingly awesome mechanics and challenges!